The three drivers shuffled positions among each other with Alexander eventually winning, Daniels second and Seuss third. There might have only been one winner, but there were definitely no losers in the top three either. 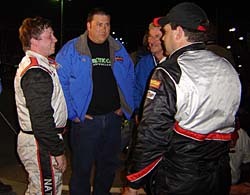 If a Hollywood script writer came up with a cast of three drivers who were battling for the victory in Saturday night’s True Value Modified Racing Series event at Seekonk Speedway, he or she couldn’t have topped how things unfolded in real life. There was last season’s teenaged Rookie of the Year Andy Seuss, who started on the pole after winning his third heat race in three events this season. Seuss had not won a TVMRS event entering the evening. His tight knit crew of family and friends claimed a victory by just making it to the race. In the first two events of the year, they lost oil pressure in their engine. Their engine builder was busy on other project this past week, so they pulled some long hours replacing internal engine parts on their own. Daniels didn’t have an easy night either. And Seuss wasn’t used to showing his stuff early on. Those were the three guys who ended up deciding the victory. Alexander eventually won that fight, but all three put on a spirited battle. Afterwards, there were no hard feelings either. All three drivers congratulated each other on their efforts. Andy Seuss was fast, but an oil pump belt ended his night. the year, he was disqualified for a minor problem with his carburetor after finishing second. All points for that event were thrown out and pit area observers wondered if he would even be back to race after that. He surprised a few people by showing up at Monadnock and scoring a dominating victory. And finally, there was the NASCAR star of sorts. Peter Daniels won the NASCAR Weekly Racing Series National championship in 2002 and capped that season off with a whirlwind media tour that included appearing on Speed Channel with Michael Waltrip. Daniels is also a former driver in the NASCAR Busch North Series. He came 26 points shy of the championship last season, but has shown up even hungrier this year. Daniels was also impressed with the youngster. Seuss led from the pole through the first half of the race. 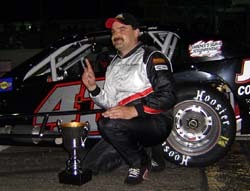 He fought off Jimmy Kuhn, Wayne Helliwell, Jr. and Louie Mechalides for the top spot early. Meanwhile, Alexander started shotgun on the field after needing a provisional to get into the race. He worked his way towards the front however and even made it look easy. There were plenty of fans to watch the Mods at the Cement Palace as well. Meanwhile, Seuss was taking notes. Equipment was also a bit of an issue in the race. Alexander started the season with a brand new Troyer chassis and it’s been flawless so far. Seuss’s team has had a few hiccups in their oiling system this season and they have been flawless in overcoming that. 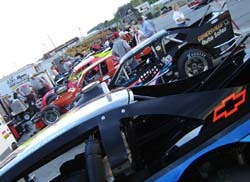 The True Value Modified Racing Series will return to action this Friday night at Lee USA Speedway. 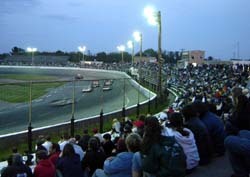 Speed51.com will be there for Make-a-Wish night and will have a full recap from the track. Andy Seuss (L) and Kirk Alexander (R) compare notes after the race. Alexander (R) also got to talk to runner-up Peter Daniels to do a little post race bench racing.